Welcome back to another amazing year of golf on the Vancouver Golf Tour! We are excited to launch another full schedule of 32 Premier Championships thanks to our Tour's 13-Year Title Sponsor IGA STORES of BC!! Our season launches with one of the funnest events of the year thanks to our good friend BRAD GARSIDE, Personal Injury Lawyer at Paine Edmonds Lawyers! This is our 13th Annual BRAD GARSIDE OPEN, which tee's off on March 18th at beautiful Beach Grove Golf Club! Please find details of the event below and SIGN UP EARLY as this event ALWAYS SELLS OUT EARLY!! The BRAD GARSIDE Open is an 18-Hole stroke play tournament for male and female Professionals and Amateurs (0-18 RCGA factor). *Must be a minimum of 5 players registered in these divisions for the division to run. Otherwise players will compete in their own handicap flight off equitable tees. As of Feb.12th, 2 x $5,000 HOLE-IN-ONE JACKPOTS!! Qualify for Order of Merit Points – $18,000 in Year-end Awards & Prizing! Priority will be given to Members in the Professional and Amateur field. Non-Members are eligible to play if the field is not full at the end of the Registration Deadline. Non-members are recommended to register well in advance as non-member entries will be accepted in priority of their entries being received with payment. (cash/cheque on day reserved for members only)!! E-Transfer your entry fees to: payments@vancouvergolftour.com. Professionals: Please contact Head Professional Brent Derrheim at 604.948.5552 or email golfshop@beachgrovegolf.com to request a practice round at an off-peak time M-F.
Tee-time Requests: All tee-time requests must be received a minimum of 72 hours in advance otherwise will not be accepted. Requests to play with players in different flights are not permitted (unless players are playing the same tee-box). Both the Professional OOM and Amateur OOMs will be based on the following point system for full fields. Order of Merit Points may be modified in any given event based on field size. The SRIXON / CLEVELAND ORDER OF MERIT WINNER - $2,500 Q-School Award! The top Professional for the entire VGT season earns a $2,500 Q-School Award at the end of the 2019 Tour Championship. 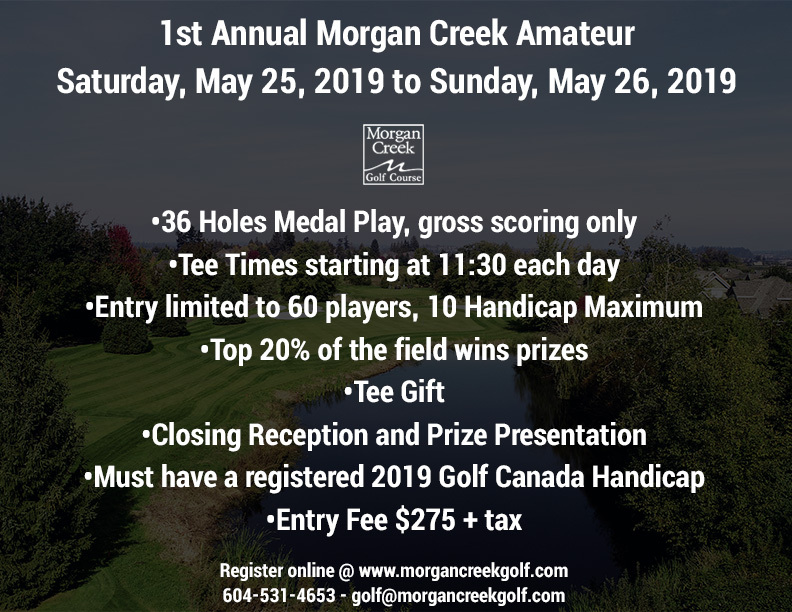 The VGT Majors Series starts with the VGT MASTERS on April 25th & 26th at Morgan Creek Golf Club includes 8 multiple-day events ending at the Johnston Meier Insurance Vancouver Open! TOP SRIXON / CLEVELAND STAFF PLAYER - $1,000 CASH BONUS! A $1,000 CASH BONUS will be awarded to the top VGT Professional on the SRIXON / CLEVELAND Order of Merit endorsing SRIXON & CLEVELAND products throughout the ’19 VGT season. Players sign a contract at the Brad Garside Open that they will be playing a minimum of 10 SRIXON / CLEVELAND clubs and the SRIXON Z-Star or SRIXON Z-Star XV ball in order to qualify for the CASH BONUS! ROOKIE OF THE YEAR - $1,000 CASH BONUS! MOST IMPROVED PLAYER OF THE YEAR - $1,000 CASH BONUS! In order to qualify for the Hole-in-one (H.I.O) JACKPOT offered at a VGT event, a player must be entered into the $20 skins game/hole-in-one pot for that event. If there is no winner of the hole-in-one at VGT event, the current hole-in-one pot will carry over to the next event until we have a winner of the jackpot. If by the end of the Summer Tour the jackpot has not been won, the current jackpot will be carried over into the Winter Tour schedule commencing on October 18th, 2019. The dress code at Beach Grove Golf Club is founded on the Value Statement and on the belief of RESPECT for fellow members, guests and staff. Doing our very best to honor the founders and tradition of this 73 year-old event, we have scheduled the 73rd Anniversary BC MATCH PLAY on some of BC’s Premier Golf Courses starting with the BC Match Play Qualifying on March 23rd & 24th at Morgan Creek and Pagoda Ridge Golf Courses. With sincere thanks to our loyal 11-year Title Sponsor GRUPO BIMBO CANADA (new owners of Canada Bread), and some amazing support from BC’s Premier Golf Courses, we are continuing to feature a TOTAL EVENT PURSE of $15,000!! GRUPO BIMBO CANADA continues to showcase some of most familiar names in bread, notably McGavins, Dempsters, Canada Bread and Villaggio. Our 2019 seeding brackets will carry these household names to see who will bring their “A” Games to play for ‘THE BREAD’! Speaking of THE BREAD, this year’s winning teams will share $5,000 in the OPEN Tournament and $1,500 in the NET Tournament based on a full field. On behalf of the Vancouver Golf Tour and our team of committee members and volunteers, we all hope you have an incredible experience at this year’s GRUPO BIMBO BC MATCH PLAY Pairs Championship. The OPEN Championship of the BC Match Play is a 2-player “Scratch” team event available to all Professionals and Amateurs (or Juniors) with a recommended 5.0 handicap factor or less. No strokes are given in this event. The qualifying tournament is an 18-hole, two-player (team) event based on best ball medal gross scores. The top 31 teams out of a maximum 64 (plus 2018 Champions, seeded #1) will qualify to play in the 32 Team Match Play Draw commencing Mar. 30th at Sandpiper Golf Course. The # of teams advancing from each qualifying round will be based on the total # of teams qualifying at each site versus the total qualifying field size. Teams will choose to qualify at one of the two sites listed (Mar.23rd or 24th) and will be seeded #2 to #32 based on their best ball gross score from qualifying. PRIZE PURSE: $11,000 based on 64 teams registered. *Amateurs are entitled to a maximum prize value of $1,000 per person. If the winning team consists of one Pro and one Amateur, the Professional would win a maximum $2,500 cash prize and his/her amateur partner will win a $1,000 gift voucher. The balance of the $1,500 will be dispersed and shared between the Runners-up, Semi and Quarter-finalists. Points will be allocated to the player’s respective Division: Professional or Championship Flight. Send payment to payments@vancouvergolftour.com by the deadline. 2. PAYING CASH or CHEQUE ONSITE (Members only). ***Amateurs are required to pay green fees in Round of 32, 16 & ¼ Finals (see fees below). The qualifying tournament is an 18-hole, two player team best ball medal net competition. The top 31 teams out of a maximum 64 will qualify to play in the Match Play Draw. Last year’s Champions will receive a bye into the 1st round and will play as the #1 Seed. The Net Championship will play out as a Round of 32 Match Play Tournament commencing Mar.30th at Sandpiper Golf Course. We will use 90% of handicaps in the qualifying event and 75% of handicaps in the Match Play event. In case of a tie for the final qualifying spot at any site, a playoff will commence immediately to determine the final team entered in the tournament. Teams will be seeded #2 to #32 based on their best ball net score from qualifying against the rating of the qualifying course. The # of teams advancing from each qualifying round will be based on the total # of teams qualifying at each site versus the total qualifying field size. NOTE: Available qualifying spots per day are based proportionately on the number of players qualifying at each site against the total # of qualifying spots. Playoffs: All ties for the last qualifying spot(s) in the OPEN & NET tournament will be broken by a sudden death playoff immediately following the qualifying round. All other ties (for seeding) are broken by GOLF CANADA retrogression. *Based on a full field of 48 teams registered. Points will be allocated to the player’s respective Division: Championship, Flight A or Flight B. 1. Pay by E-TRANSFER. Send payment to payments@vancouvergolftour.com. 2. Pay CASH or CHEQUE ONSITE (Members only). Members are asked to enter the event thru the member portal in Golf Genius. If paying by credit card or E-Transfer, fill-out the BC Match Play online form listed here: https://vancouvergolftour.com/payment/ and list your partner’s name. entering the event on Golf Genius. After clicking "Playing" the event, another screen will open. Please message the manager and indicate your partner’s name. Non-Members are asked to pay individually online and enter their partners name on the registration form. If players want to enter the event with a random partner, they may do so. Please enter “Need Partner” on the online form or by using "Send message to manager" option in golf genius. NOTE: ALL Amateurs are responsible for their own green fees in the rounds of 32, round of 16 and the quarter-finals. Complimentary appetizers or lunch will be included at each round of the Match Play. Amateur green fees will be payable at the registration table on the day of the event. Semi-finalists and finalists will have all green fees and lunch taken care of. Round of 32 @ Sandpiper: $55+GST/amateur- includes green fee and $10 voucher. Round of 32 @ Sandpiper: Pros pay $10 for lunch voucher. Quarter-finals @ Meadow Gardens: $55+GST/Amateur - includes green fee, range + meal after round. Pros pay $20 - Includes a $10 donation to Junior Golf and their meal after round. No Fees are required for Pros or Amateurs. Lunch is provided at the turn. No Fees are required. All finalists are provided lunch prior to PM Matches. With sincere thanks to our loyal 11-year Title Sponsor GRUPO BIMBO CANADA (new owners of Canada Bread), and some amazing support from BC’s Premier Golf Courses, we are continuing to feature a TOTAL EVENT PURSE of $15,000!! GRUPO BIMBO CANADA continues to showcase some of most familiar names in bread, notably McGavins, Dempsters, Canada Bread and Villagio. Our 2019 seeding brackets will carry these household names to see who will bring their “A” Games to play for ‘THE BREAD’! The VGT LEDGEVIEW CLASSIC is an 18-Hole stroke play tournament for male and female Professionals and Amateurs (0-18 RCGA factor). Must be a minimum of 5 Women or Senior Male Amateurs registered for there to be a Division for this event. If not, then players will play within their own division or handicap flight off equitable tees versus the male (or non-senior) competitors. Professional Purse: $6,500 (based on 44 Pros). Amateur Prizing: $40/player goes into prize credits. Fifty (50) Amateurs in field = $2,000 prize credits. 18-Holes of Golf at Ledgeview Golf Club – The pride of 2 PGA TOUR Winners Adam Hadwin & Nick Taylor! Both Pros & Amateurs Qualify for Order of Merit Points to earn $20,000 in Year-end Awards & Prizing! Priority will be given to Members in the Professional and Amateur field until deadline to enter. Non-Members are eligible to play if the field is not full at the end of the Registration Deadline. Non-members are recommended to register in advance as non-member entries will be accepted in priority of their entries being received if we have space available for some but not all non-members waiting for the field to be open at the deadline. Amateurs: Please contact Ledgeview Golf Club to arrange a practice round at 604.859.8993. The green fee rate as of March 1st, 2019 is $40+GST/weekdays and $45+GST/weekends as posted on Ledgeview’s website, but this may change due to weather and course conditions. As of April 1ST, 2019 Ledgeview Golf Club will rise to mid-season rates. VGT Amateur Members are entitled to practice rounds at the VGT Preferred Rate of $10 off the posted rate as of April 1ST. Professionals: Please contact Ledgeview Golf Club at 604.859.8993 to request a practice round at an off-peak time M-F at the discretion of their Golf Shop staff. Ledgeview Golf Club features a scenic and enjoyable par 70 in the Fraser Valley. This 18 hole design is the pride of many local golf Champions including Ray Stewart, James Lepp, Andrew Smeeth and PGA TOUR winners Adam Hadwin and Nick Taylor. Both the Professional OOM and Amateur OOMs will be based on the following point system for full fields for this event. Order of Merit Points may be modified in any given event based on field size. PŪRATAE MAJORS SERIES ORDER OF MERIT – $5,000 IN BONUSES! The VGT PAGODA RIDGE CLASSIC is an 18-Hole stroke play tournament for male and female Professionals and Amateurs (0-18 RCGA factor). Must be a minimum of five (5) Women or Senior Male Amateurs registered for there to be a separate Division for this event. If not, then players will play within their own division (Pro/Am) and handicap flight from equitable tees versus the male competitors (approx. 85% of yardage). Professional Purse: $7,000. (based on 48 Pros). Top 40% of Pro field will be paid out. Women’s Open Division: Results and payouts are based on Gross Scores only! Pros will earn cash. Amateurs will earn prize credits. Amateur Payout: Top 1/3 Field paid out prize credits via alternating Gross and Net Scores in all flights. Opportunity to play one of BC’s Top Public Courses in Championship Conditions! Players qualify for valuable points in the Cleveland/Srixon Order of Merit Race. A chance to share in over $18,000 in Year-end Prizing including a trip to a 2020 PGA TOUR EVENT! Please contact Pagoda Ridge Golf Shop to request a practice round at an off-peak time M-F. It is at the Pro-shop staff’s discretion when complimentary practice rounds are to be provided for Professionals. Pagoda Ridge Golf Course offers a distinctive golf experience… carved through a landscape of gently rolling hills and natural vegetation, with stunning views of the Fraser Valley and majestic Golden Ears Mountains. The VGT SANDPIPER CLASSIC is an 18-Hole stroke play tournament for male and female Professionals and Amateurs (0-18 RCGA factor). Please contact Sandpiper Golf Course Golf Shop to request a practice round at an off-peak time M-F. It is at the Pro-shop staff’s discretion if and when complimentary practice rounds are to be provided to Professionals. Professionals must carry their PGA Card or VGT Membership card as their credentials and verify they are registered in the field for this event as a Professional. Recent winner of the PGA of BC’s “Hidden Gem” awards, is located 75 minutes East of Vancouver and is open to the public 364 days a year. This par 72 course runs 6,500 yards from the back tees, and is gently sloped, featuring four sets of tees for all playing abilities. Canadian course designer, Russ Olsen, has done an amazing job of taking advantage of the spectacular water and mountain vistas when designing this masterpiece. Sandpiper Golf Course has played host to several Vancouver Golf Tour events, most notably the Canada Bread BC Match Play & the VGT’s Inaugural 36-Hole Major Series Event the ‘2013 VGT Sandpiper Open’. MAJOR SERIES OF PUTTING (MSOP) - AFTER THE ROUND!! Amateur Payout: Top 1/3 of Field paid out via alternating Gross AND Net Scores in all amateur divisions. *Note: There must be a minimum of 10 Flight A and 10 Flight B players registered for prizing to be paid out in separate flights. If less than 10 players registered in each flight, the top Flight A and top flight B Gross winners will be paid out and then all other prizing will be based on net scores in Flight A & B combined. There must also be a minimum of five Senior Amateur players (55+over) registered for the event by the deadline for there to be a separate Senior Division event. If not, players will play in their own flight for the 18-hole event. Order of Merit points will always be collected within a player’s own flight, not shared flighting! *Players can AVOID online admin fees when paying by E-Transfer, or (for Members only) cash on day. Qualify for Order of Merit Points – Over $7,500 in Amateur Year-end Awards & Prizing including a trip to watch a 2019-20 PGA TOUR event!! Priority will be given to Members in the field until the registration deadline. Non-Members are eligible to play if the field is not full at the end of the Registration Deadline on April 21st. Non-members are recommended to register in advance as non-member entries will be accepted in priority of their entries being received if we have space available for some but not all non-members waiting for the field to be open at the deadline. Registration Deadline: Sunday, April 21st, 2019 at 6pm PST or when event is full (whichever is 1st). Players must show either their 2019 VGT Membership Card or confirmation of payment for the VGT Masters event to receive preferred green fee price. Recognized as one of Vancouver’s top golf facilities, this is the place for golfers who want to hit the links year-round – whether you’re on your own or enjoying a little friendly golfing competition with 160 of your closest friends. (Around here, golf is always a big event). MAJOR SERIES OF PUTTING - COMING TO THE VGT MASTERS!! Only golfers that play in this event are eligible to compete. Each participant receives a free entry into the putting contest and participants can purchase retries to improve their position (1 retry for $10, 3 retries for $20). The Top 10 and ties are entered into the Regional Finale. MSOP – Major Series of Putting – is the biggest series of putting tournaments in history. MSOP gives professional and amateur golfers from all walks of life the opportunity of a lifetime to show off their skills with the putter and compete in high-stakes putting tournaments. MSOP is comprised of a nationwide Tour and the Las Vegas Championships. At the end of the ’19 VGT Tour Championship, the Top 10 Amateurs in each Flight will share in over $7,500 in prizes! In order to qualify for the Hole-in-one (H.I.O) JACKPOT offered at a VGT event, a player must be entered into the $20 skins game/hole-in-one pot for that event. If there is no winner of the hole-in-one at VGT event, the current hole-in-one pot will carry over to the next event until we have a winner of the jackpot. If by the end of the Winter Tour the jackpot has not been won, the current jackpot will be carried over into the Summer Tour schedule commencing on March 20th, 2017. If the jackpot accumulates to $5,000, it will be cut-off at $5,000 and the first eligible person (see above) to score a hole-in-one on an eligible jackpot hole will receive the $5,000 payout. A secondary Hole-in-one purse will be started as soon as the original jackpot reaches $5,000. From the time the original purse reaches $5,000, moneys collected for the H.I.O purse will accumulate in this secondary pot while the first pot remains at $5,000. The secondary pot will continue to grow until the next eligible player scores a hole-in-one on the designated jackpot hole at a VGT event. The maximum H.I.O purse paid out at any time will be $5,000. VGT allows the A & B amateurs to tee-off a shorter designated tee-box at various times compared to Professionals and Championship Amateurs. VGT hosts Amateur only events where Amateurs can win the JACKPOT without Pros in the field. Round 2: 7am start. Leaders off at approximately 10am. The JM MEDIA VGT MASTERS is a 36-Hole VGT MAJOR Stroke play tournament for male and female Professionals and Championship Amateurs (5.0 handicap factor or less) contested at Morgan Creek Golf Course. First place: $3,000*. Top 33% of Professional field will be paid out. Women’s Series Open Prizing: Pros & Amateurs will compete in same field. Pros will earn cash & Amateurs will earn prize credits. 2018 Champion: James Allenby (128) Winner of $3,000 cheque. This event is the 1st of 7 events on the MAUI JIM Women’s Series. Bonus cash and prizes will be awarded at the end of the 7th Women’s Series event (Vancouver Open). This event is the 1st of 8 events on the VGT MAJORS SERIES. Bonus cash and prizes will be awarded at the end of the 8th VGT MAJORS SERIES event (Vancouver Open). Srixon/Cleveland Order of Merit Event – Qualify for over $18,000 in Year-end Awards & Prizing! Priority entry will be given to VGT Members in both the Professional and Amateur field. However, Non-Members are eligible to play if the tournament field is not full at the end of the Registration Deadline on April 21st. Non-members are recommended to register in advance as non-member entries will be accepted in priority of their entries being received if we have space available for some but not all non-members waiting for the field to be open at the deadline. Sunday, April 21st, 2019 at 6pm PST or when event is full (whichever comes first). Players are reminded to review the Policies and Procedures of VGT outlining all cancellation and no-show fees HERE. MAJOR SERIES OF PUTTING (MSOP) - COMING TO VGT!! MSOP LOCAL QUALIFIER - RIGHT AFTER THE ROUND!! VGT MAJORS SERIES ORDER OF MERIT – $5,000 IN BONUSES! 1st Place: $2,500. 2nd Place: $1,500 & 3rd Place: $1,000. **Must play in a minimum of 5 MAUI JIM WOMEN’SSERIES events to be eligible. In order to qualify for the Hole-in-one (H.I.O) JACKPOT offered at a VGT event, a player must be entered into the $20 skins game/hole-in-one pot for that event. If there is no winner of the hole-in-one at VGT event, the current hole-in-one pot will carry over to the next event until we have a winner of the jackpot. If by the end of the Winter Tour the jackpot has not been won, the current jackpot will be carried over into the Summer Tour schedule commencing on March 18th, 2019. *5 or more female or Senior players required to qualify for a full women’s or Senior Division. When registering players must confirm they wish to play in either of these 2 Divisions. If less than 5 players in either of these flights, golfers will compete in their own hdcp flight versus male golfers, and off an equitable tee of same rating and slope. Qualify for Order of Merit Points – Over $7,500 in Year-end Amateur Awards & Prizing! Priority will be given to VGT Members in the field. Non-Members are eligible to play if the field is not full at the end of the Registration Deadline. Non-members are recommended to register in advance as non-member entries will be accepted in priority of their entries being received if we have space available for some but not all non-members waiting for the field to be open at the deadline. SAVE $10 on your entry when you bring $100 in IGA receipts to registration!! Registration Deadline: Wednesday, May 1st, 2019 at 6pm PST or when event is full (whichever comes first). VGT Members are entitled to a 10% discount off regular posted green fee rates 7 days a week. Players must present their 2019 VGT Membership card and be in good standing to qualify for green fee discounts. All non-members must confirm payment online in order for their entry to be considered for an event. Once the deadline for entry has been reached and the event is not full with members, non-member entries will be accepted on a priority based on date of event payment. World-renowned golf course architect and seven-time major tournament champion Arnold Palmer designed this 18-hole course. The Canal Course consists of 7,000 yards of gently rising terrain, and meandering streams and canals with exceptional conditions year-round. Monday, May 6th, 2019 at 6pm PST or when event is full (whichever comes first). Mar 1 thru Oct 1 – 24hr advance booking – 7 days a week after 12:30pm excluding twilight, holidays, tournaments, or events, applicable to regular rates only, plus 10% off food. Registration Deadline: Monday, May 13th (6pm PST) or when the event is first full. *Must have minimum of 5 registered in each flight for prizing purposes. Priority will be given to Members in the Amateur field. Non-Members are eligible to play if the field is not full at the Registration Deadline (May 13th). Non-members are recommended to register in advance as non-member entries will be accepted in priority of their entries being received if we have space available for some but not all non-members waiting for the field to be open at the deadline. *3% online convenience fee applies for online cc payments. Both the Amateur OOMs will be based on the following point system for full fields for this event. Order of Merit Points may be modified in any given event based on field size. In order to qualify for the Hole-in-one (H.I.O) JACKPOT offered at a VGT event, a player must be entered into the $20 skins game/hole-in-one pot for that event. If there is no winner of the hole-in-one at VGT event, the current hole-in-one pot will carry over to the next event until we have a winner of the jackpot. If by the end of the Winter Tour the jackpot has not been won, the current jackpot will be carried over into the Summer Tour schedule commencing on March 19th, 2018. FINAL EVENT TO QUALIFY FOR FREEDOM 55 FINANCIAL OPEN! Round 1: Sandpiper Golf Course. 9:30am Start. Pros lead off. Round 2: Chilliwack Golf Club. 11am start. Leaders off at 2pm with full field. Maui Jim Women’s Series: Female Pros & Amateurs will compete against each other in a Women's Open event. Pros will earn cash & Amateurs will earn prize credits if they are in the top 1/3 of the Women's field size. *If there are less than a total of 5 female Open players, then the Female Pros will compete in the Male Pro Division and the female Amateurs will compete against the male Championship Flight golfers. Female golfers will play off an equitable length set of tees (approx. 15% shorter than men). MAUI JIM BONUS: The Top Female Pro will be guaranteed a $250 cash bonus and the top Female Amateur will be guaranteed a $200 Prize Credit courtesy of Maui Jim Sunglasses. Srixon/Cleveland Order of Merit Event – Qualify for over $17,000 in Year-end Awards & Prizing! Priority entry will be given to VGT Members in both the Professional and Amateur field. However, Non-Members are eligible to play if the tournament field is not full at the end of the Registration Deadline. Non-members are recommended to register in advance as non-member entries will be accepted in priority of their entries being received if we have space available for some but not all non-members waiting for the field to be open at the deadline. Amateurs: Please contact Sandpiper Golf Course at 604.796.1000 to arrange a practice round. VGT Amateur Members are entitled to practice rounds at the VGT Preferred Rate of $35/player year-round valid Monday-Friday excluding holidays after 12pm. (Taxes Extra) Or use the TSN 1040 Discount Golf Card. See offers HERE. Professionals: Please contact General Manager Ted Swaine at 604.796.1000 or email Ted Swaine at ted@sandpiperresort.ca to request a practice round at an off-peak time M-F. Tee-times are at the discretion of the GM. • Professionals: Take advantage of an 8 Week Membership opportunity from April 1 to May 31st - $300.00 including tax. • Please call Professional Colin Macintosh at the Chilliwack Golf shop at 604 823-6521 or 1-888-757-7222 to arrange for this membership opportunity. PGA Canada or Mackenzie Tour Members are asked to contact Colin MacIntosh at the Chilliwack Golf Shop to request one complimentary tee-time at a non-peak time. All other players, practice Rounds are at $25 + GST per player at available times for the club. Sunday, May 12th, 2019 at 6pm PST or when event is full (whichever comes first). The Chilliwack Golf Club, established in 1958, is a semi-private facility located between Chilliwack and Abbotsford, only 45 minutes from Vancouver. It features magnificent tree lined fairways, a creek that meanders through the back nine and breathtaking mountain vistas in every direction. Members and non-members have enjoyed the Fraser Valley’s most popular golf course for over 50 years. With a reputation for year round world class conditioning, Chilliwack has played host to every major Provincial Championship – and always to rave reviews. Pro Registration: Accept the invite here or "click play" from the golf genius app for this event. All teams are sponsor teams & you will be paired up with a sponsor group for the day! Entry fees are payable with cash, cheque or CC on the day. This event is an official event on the 2019 Cleveland/Srixon Order of Merit with the standard 18-hole point payout. NOTE TO AMATEURS: Please contact Christophe Collins on his details below to enquire about fielding a Pro-Am team for this great event! Please note, we will not be taking registrations through the VGT Member portal for Amateur team registrations!! All entries must go through the First Tee by way of contacting Christophe Collins. Thank-you! The 9th annual First Tee Pro-Am Challenge is all about raising funds to ensure vulnerable kids and youth can have the opportunity to learn the game of golf. The First Tee of the YMCA of Greater Vancouver enables kids ages 6-17 to learn how to set goals and build character while learning fundamental golf skills. Kids also learn essential life skills and positive values while having a whole lot of fun. Let’s face it—kids learn best when they’re having fun! This exciting shotgun tournament will offer amateur players an intimate experience to compete in an 18 hole team scramble with one of Canada’s premier golf professionals. Pros will be available to answer any golf-related questions and provide some swing advice. Participants receive a golf cart for their round, lunch, access to on-course hospitality tents and a gala reception dinner with silent and live auctions. Introduce the Life Skills Experience Program™ to over 1,500 young people through our targeted outreach programming in partnership with the Vancouver and Surrey school boards. Serve over 600 youth in after-school, spring break and summer camp registered programs. Provide free Life Skills Experience Program™ to over 200 children from the downtown eastside. Contact us for sponsorship opportunities and to register a team! Amateur Payout: A total of 30 Prizes will be awarded based on a full field of 100 golfers. The top Gross & Top Net Scores in each flight will prize out (alternating Gross and Net). The Top Gross score in each flight will also win a personalized Championship Plaque. The event is open to all Amateur Golfers with a valid Golf Canada or USGA handicap card. Members will have until June 5th, 2018 to confirm their registration for this event thru their Golf Genius member profile. If the event is not full with members at such a time, all non-members who have pre-registered will be admitted into the field. E-transfer payments are to be sent to payments@vancouvergolftour.com. Please use the password: ‘Vancouver’. *Cash or cheque payments can be made by members in good standing at registration on Day 1 of the tournament. Please have correct change if you are paying by cash. Tuesday, June 4th, 2019 at 6pm or when the field is full. Tee Times: Start at 11am both days. Tee Gift = Choice of Pair of 2UNDR briefs or LINKSOUL hat. Trophies awarded to players for Overall Gross in all 5 Divisions*. Live Scoring on Digital Screens at the 9th green and 18th. *Must be a minimum of 5 players signed up in each division to hold separate division. World-renowned golf course architect and seven-time major tournament champion Arnold Palmer designed both of these 18-hole courses. The Ridge Course consists of 6,900 yards of gently rising terrain, meandering streams and deep, cold lakes. And the Canal Course measures over 7,000 yards from the Championship Tees and offers plenty of challenges both on the greens and with the meandering canals throughout the golf course. Amateur OOMs will be based on the following point system for full fields based on gross results. Order of Merit Points may be modified in any given event based on field size. The NICKEL HEATING OPEN Presented by TRANE is a 36-Hole stroke play Championship for male and female Amateur Golfers (with Golf Canada Registered factor of 18.0 or less). Tuesday, June 5th, 2018 at 6pm or when the field is full. Trophies awarded to players for Overall Gross in all 5 Divisions. The VGT PAGODA RIDGE OPEN is an 18-Hole stroke play tournament for male and female Professionals and Amateurs with a certified GOLF CANADA or USGA hdcp factor (18.0 or less). Professional Purse: $7,000 (based on 48 Pros). Top 35% of Pro field will be paid out. Amateur Prizing & Tee-Gifting: $50/player goes into prizing. Fifty-two Amateurs in field = $2,600 prize credits. Qualify for Order of Merit Points – Over $15,000 in Year-end Amateur & Professional Awards & Prizing! The par 72, 18-hole course plays just beyond 6,900 yards from the back tees. The fairways are well defined, with 40 strategically placed bunkers and water hazards in play on more than half of the 18 holes. These add to the degree of difficulty, while the open greens make Pagoda Ridge an enjoyable place to play. The bent grass greens are large and inviting, tempt the “go for it” attitude yet often rewarding the more accurate approach shots. (Fraser Valley, B.C.) Chilliwack Golf Club and Sandpiper Golf Course are excited to announce the 5th ANNUAL FIRST CLASS WASTE SERVICES FRASER VALLEY OPEN. This two day, 36-hole tournament will host 40 of BC’s leading Golf Professionals and 80 Amateur golfers. “The Fraser Valley Open will be one of the largest prize purses on the Vancouver Golf Tour (VGT) ‘order of merit’ schedule, and we are excited to partner with Fraser Mulholland and the VGT” stated Organizing Committee Member Bryan Ewart. First Place: $10,000* (*based on full field). Top Gross and Net Scores in 3 Handicap Flights will win prizing. This is an open event for Amateurs. Priority will be given to the first 80 paid entries. All amateur participants must have a valid Golf Canada HDCP not to exceed 18.0. All Professionals must be a 2018 VGT Member in good standing. The top 10 eligible VGT Pros from the 2017 Order of Merit + the top 10 VGT Pros on 2018 Order of Merit (as of May 30th) are exempt in the field and have until June 15th to register to hold their position in the field. 8:30am Start. Final Tee-time at 2:30pm. Over $14,000 in bonuses are available at the end of the 2018 season for the top VGT Professional and top Amateurs in each Flight on the VGT Order of Merit. Round 1 – Chilliwack Golf Club, established in 1958, is a semi-private facility located between Chilliwack and Abbotsford-- only 45 minutes from Vancouver. It features magnificent tree-lined fairways, a creek that meanders through the back nine and breathtaking mountain vistas in every direction. The club has 500+ members who are passionate about both golf and their club. Seeing more than 50,000 rounds played last year, the Chilliwack Golf Club is a popular destination for many golfers in the area and plays host to one of the longest running and most successful “Opens” in the province each July. Round 2 – Sandpiper Golf Course, recent winner of the PGA of BC’s “Hidden Gem” awards, is located 75 minutes East of Vancouver and is open to the public 364 days a year. This par 72 course runs 6,500 yards from the back tees, and is gently sloped, featuring four sets of tees for all playing abilities. Canadian course designer, Russ Olsen, has done an amazing job of taking advantage of the spectacular water and mountain vistas when designing this masterpiece. Sandpiper Golf Course has played host to several Vancouver Golf Tour events, most notably the 2013 Canada Bread BC Match Play & the VGT’s Inaugural 36-Hole Major Series Event the ‘2013 VGT Sandpiper Open’.